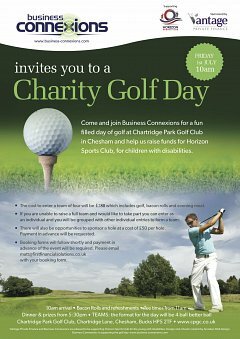 Business Connexions will be hosting a fun filled day of golf at Chartridge Park Golf Club in Chesham on Friday 1st July at 10am to raise fund for Horizon. You can enter a team of four or if you are unable to raise a full team and would like to take part you can enter as an individual and you will be grouped with other individual entries to form a team. If you are unable to attend but would still like to support the day there will also be opportunities to sponsor a hole. The cost of entry will include golf, bacon rolls and an evening meal, for more information please see the poster or email matt@firstfinancialsolutions.